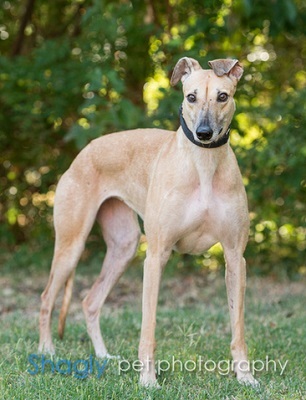 Delly, aka Coach Delly, is a 3-year-old female born April 11, 2012. Her sire is Flying Penske and her dam is Coach Hogan. Delly has no races on record. We do not know where she was before being found laying in a yard in Fort Worth. The FWACC personnel had to carry her into the shelter, as she was too weak to move. She was transferred to GALT and immediately evaluated by Dr. Soileau & Dr. Ellis at VCA Preston Park Animal Hospital. She is very underweight at just 46 pounds, her eyes are clouded over, and her left rear leg is withered and lame. Tests indicate she is heartworm negative, but positive to the tick-borne disease Ehrlichia Canis. She is also carrying a heavy load of intestinal parasites. Her treatment has started, and her eyes and lame leg are being evaluated. Delly was see by Dr. Christy Soileau and she has gained 7.7 pounds. The opacity and edema in both her eyes has 90% resolved and her gums are pinking up. Limited x-rays reveal an old fracture to Delly's socket between her hip joint and pelvis. Further x-rays will be taken when her health allows for sedation. 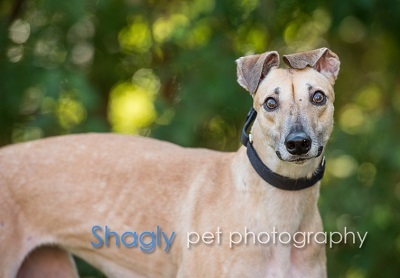 Delly has successfully completed her treatment for Ehrlichia Canis. The results of her PCR (Polymerase Chain Reaction) test are negative to all tested tick-borne diseases, so she has now completed all her medical procedures. Her eyes are completely clear, and she is one happy girl who is ready to find her forever home!